Some changes are coming to my house. My living room has been yellow for the last 10 years. It was painted just before my older daughter, middle child, graduated from high school in 2002. This June, my last child, also a daughter, will graduate from high school. Although our grad party will be at the country club (she's a golfer), I know relatives in town for graduation will migrate here, and I have told Mr. Organized Clutter it's time. I am going from the color "Sawdust" to "Dover White". When you last saw my mantel, it was January 6th, and the decorations had just come down. 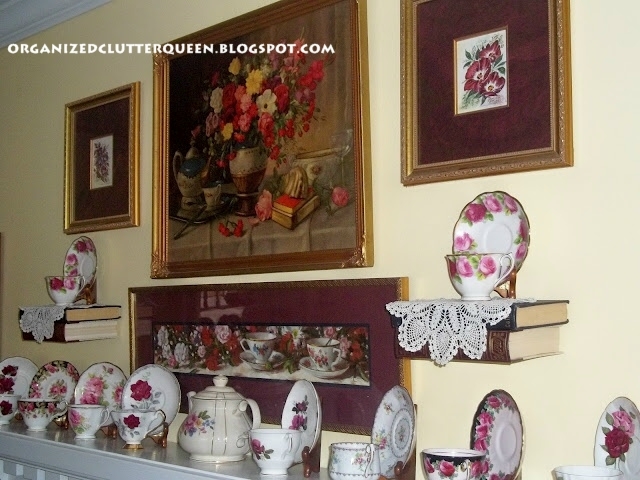 Teacups across the mantel top and floral art hung above them. 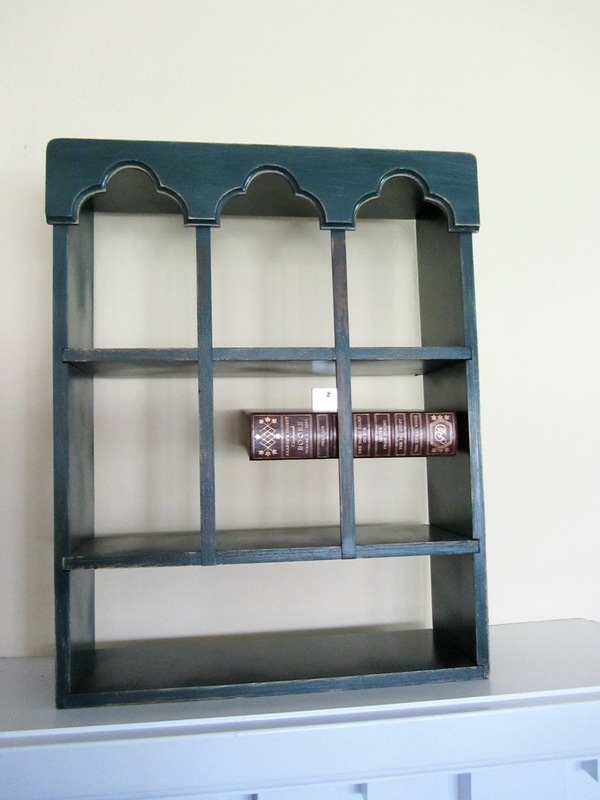 Reader's Digest condensed books made into shelves. I can't knock it, because I like it. I love flowers and teacups. Everything is coming down. Even the book shelves. These were fun. I glued an "L" bracket into the bottom of the book and screwed it to the wall. Then I placed another book on top. Cute little shelves. But CHANGE is coming. The book shelves are not down yet, (waiting for Mr. Organized Clutter) but this is my new purchase. A $24 shelf. I am not going to hang art or mirrors or shelves over the mantel. Hanging wall items makes it difficult to change seasonally. How do you find other art to line up with your nails in the wall? 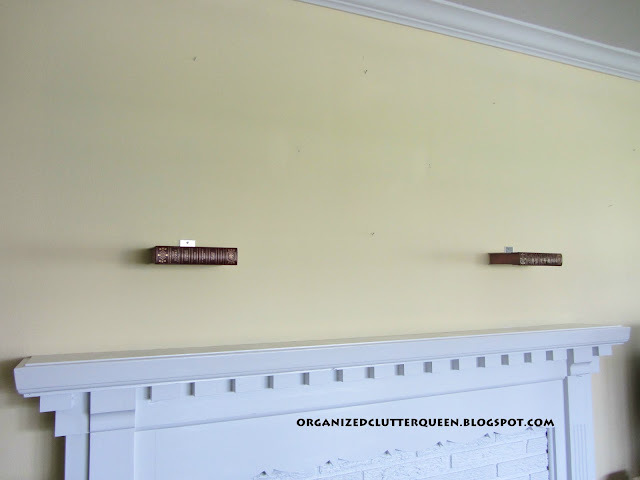 I plan to set and lean everything on the mantel shelf. This shelf is going to be painted an heirloom white. 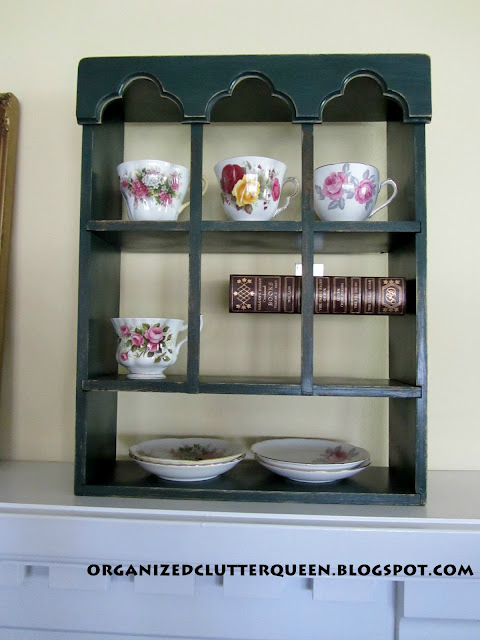 Once I have the room painted Dover White, and this shelf painted Heirloom White, I will place six teacups in the top part and six saucers will sit on the bottom shelf. I probably will also lean this picture against the wall on the mantel. I don't think I can put it away. It's a favorite. Coming soon, bathroom full reveal, (next post), white painted built ins in the den reveal, and white walls returning to the living room! Stay tuned because, planting the flower and junk gardens happens in May. I love those 'book shelves'! Great idea! And that shelf was a great buy. Thanks for sharing. I have several walls painted that pale yellow......called tealight. I also have a shelf that looks so much like yours. We always got alot of work done when there was a graduation. It will be fun for you to start ll over. I can tell you like tea (or cups and roses anyway) as much as I do! 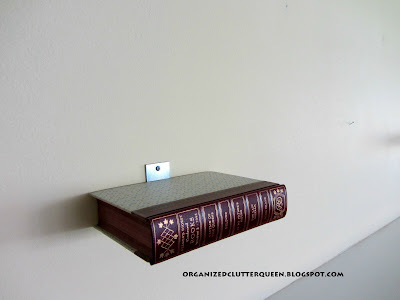 I think your "book" shelve is so clever! Carlene, You never can go wrong with white..regardless of the shade. Your teacup rack will be pretty in Heirloom White. I think it'll really show off your teacups. 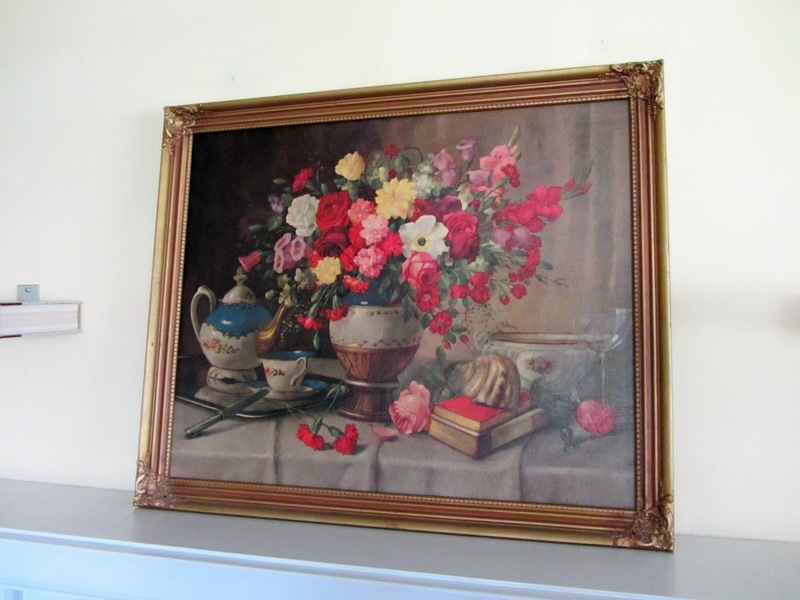 Your still life picture will look great on the mantel. Looking forward to the reveal. I love your main framed print or is an oil painting? I bought one very similar from eBay years ago. It's an oil painting and i bought it from China. Cost $17 with postage to Australia and then $350 for framing. Framing is very expensive in Australia, don't know about the US? Anyhow it's a feature in my bedroom and I still LOVE it 10 years later. Thanks for sharing your changing room news. Will look forward to updates. I love your floral picture! I have a similar one, only a smaller version over my couch with blue & white plates on the sides. I think you're doing the smart thing. Decorating mantels is HARD! The book shelves are very smart. I think painted white or close to white they would also be gorgeous they are such a pop of surprise and whimsy. But it sound like it is all going to be wonderful can't wait to see the reveal. That teacup rack will definitely look great. I do love that painting too. I think change is always good and paint makes it cheap and easy! 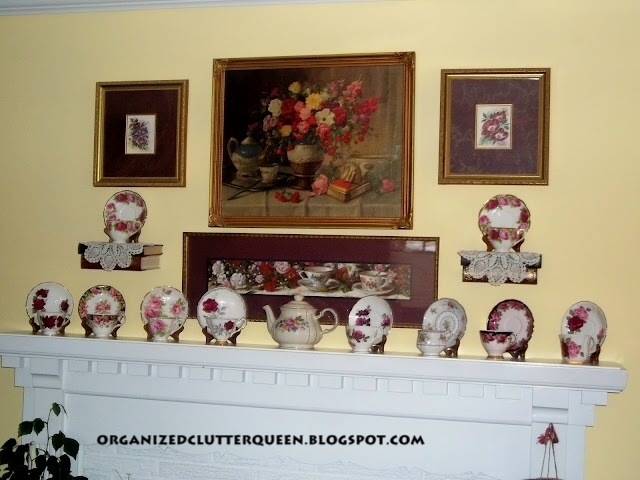 I collect vintage cups and saucers and teapots -- love your collection! Paint makes a world of difference. Have fun creating your book shelves. Your collection of heirloom teacups is beautiful.